Start Spring Term Strong in the Mudd! We just love the feeling of a new term, when minds and notebooks are fresh and the work feels manageable. Staying abreast of readings and assignments and spending quality time with coursework from the very beginning of the term will go a long way toward avoiding stress later, when papers and projects and finals are looming. Are you feeling motivated to start your spring term strong? We offer group study spaces throughout the first and second floors, including helpful tools like moveable white boards and standing desks. Why not create a study group during the first week of the term and begin meeting regularly to discuss readings and to further analyze ideas presented in class? For more group study options, check out a private group study room on the second or third floors, where you will find large blackboards and whiteboards for parsing difficult concepts or formulas. The second floor group study room has a computer and a large screen monitor, prefect for practicing presentations or compiling and sharing large amounts of data. For times that you’d rather study alone, the third and fourth floors offer quiet space and individual study carrels perfect for deep reading, research, reflection, and writing. Speaking of research, we offer a plethora of books, over 20,000 music scores, 103,000 microforms and a digital microform reader and scanner, tons of electronic resources organized by subject, periodicals and newspapers, videos, and many government documents. Becoming familiar with the stacks and with our online resources and digital collections before midterm madness is a great way to ensure your academic success and to mitigate stress later. If you need assistance navigating all of our resources or are in need of research guidance of any kind, our friendly reference librarians are available to assist you. You can even schedule a research appointment and meet with a librarian one-on-one! The earlier you start a dialogue with the librarians about a particular project, the better. And even without a project on the horizon, the librarians would love to take a few moments to get to know you. Stop by the reference desk to say hello. The Mudd is here to help you succeed! We can also help to reduce your stress and maximize your experience at Lawrence. Start your spring term strong by spending some time with us. Come tenth week, you’ll be glad that you did. If you have used the microform readers of the past, you may remember having to squint to see poor quality images and putting a substantial amount of effort into reading the material. Our new ViewScan II digital microform reader adds digital magic* to your microforms! The ViewScan II allows you to edit and crop frames, resulting in content that possibly looks better than when it was first printed back in 1900 (or whenever)! 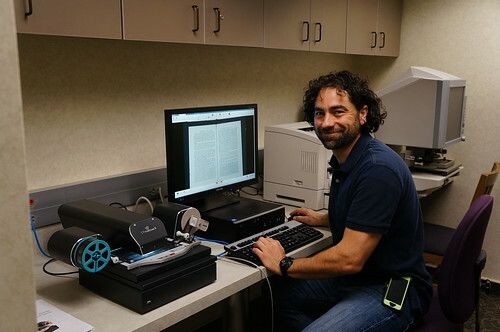 Associate Professor of History, Jake Frederick, has been visiting the Mudd Library to use the ViewScan II quite often as he prepares for a publisher’s deadline. After trying to read a microfilm reel for years on machines at other libraries, Professor Frederick was ecstatic to discover how readable the ViewScan II made his microfilm copy of a document from the 18th century. Normally using microfilm is like trying to read badly printed newsprint in a moving car at night. It’s blurry, dark, never focuses on the whole page at the same time, and is likely to make you seasick. I have had some microfilm sitting in my office for the last nine years that I could hardly bring myself to look at because it’s usually so terrible to use. The new scanner in the library is awesome. It has literally taken away everything that made using microfilm awful. I can’t believe how much better it is. In addition to editing, the ViewScan II allows patrons to save microform images (from microfilm reels, microcard, etc.) to a USB flash drive, or to print directly to the nearby laser printer. If you’d like to use the ViewScan II, the Mudd has a variety of microform materials, including The New York Times newspaper dating from 1851, as well as the Milwaukee Journal and the Milwaukee Journal Sentinel starting from 1884. Have questions about using microforms? Contact our friendly reference librarians, or ask us at the reference desk! *No actual magic is used in this machine, however the technology is quite useful.